The true meaning of Christmas everyday! This is a great Christmas eve tradition - make marshmallows as a family with a cup of hot chocolate. Preparation1. In a bowl, mix cornstarch and confectioners' sugar. Grease a 9-by-13-inch baking pan, then dust with some of the cornstarch mixture, reserving the rest. Pour 1/2 cup cold water into a bowl; sprinkle gelatin on top. 2. In a medium saucepan, combine sugar, corn syrup and salt. Bring to a boil. Continue cooking until mixture registers 260ºF on a candy thermometer, about 7 minutes. Immediately remove from heat and, with an electric mixer running on medium-high speed, pour into bowl with gelatin mixture. 3. Continue beating until mixture has quadrupled in volume, about 5 minutes. Add vanilla, then add food coloring, if desired, drop by drop, until marshmallow is desired shade of pink. Continue beating for 4 minutes longer, then transfer marshmallow to prepared baking pan. Working quickly, use a silicone spatula or long offset spatula to spread marshmallow before it sets. Cover pan with plastic wrap and refrigerate for at least 8 hours. 4. Sift some of remaining cornstarch mixture over a baking sheet. Lift marshmallow from the pan in one single sheet, placing it face down on cornstarch-sugar mixture. 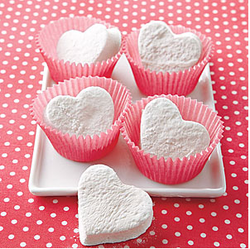 Use a lightly greased heart-shaped cookie cutter to cut marshmallow, dusting edges of hearts as you go with more of remaining cornstarch-sugar mixture to prevent them from sticking. Marshmallows will keep in an airtight container at room temperature for up to 1 week.